As a follow-up to this year's New Blogger Blog Hop, Yvonne (of Quilting Jet Girl) organized a second blog hop featuring new 12" blocks designed by participants. Those who had participated in previous New Blogger hops were invited as well, and I'm so excited to be a part of this huge group. There are over 60 quilters participating, so there are sure to be plenty of amazing designs. Thanks, Yvonne, for organizing this hop, and for inviting me to participate! Fabri-Quilt gave each blogger a fat-eighth bundle of these beautiful solids to use to make our blocks. 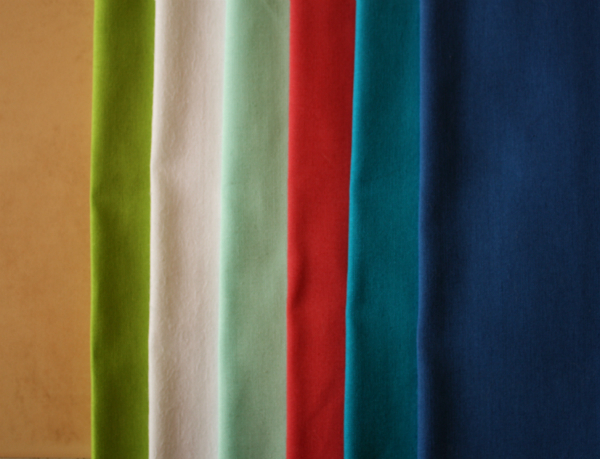 From left to right, these are Chartreuse, White, Aqua, Coral, Turquoise and Lapis Blue. Our finished blocks will be made into charity quilts, which I think is such a great idea. Allow me to introduce Stained Glass Star. 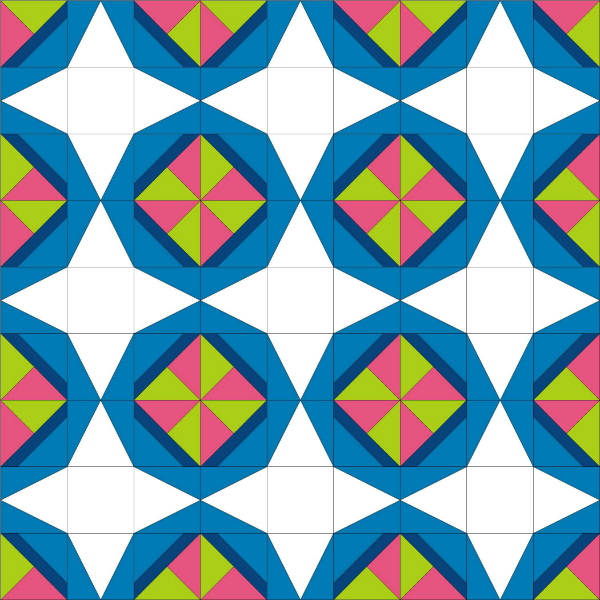 This block features traditional piecing and paper piecing, and creates a fun secondary design. I love stars and pinwheels! Before I start the instructions for making the block, I wanted to mention that this block uses the stitch-and-flip method of construction, which tends to waste fabric. To keep the waste to a minimum, I used Bonnie Hunter's Triangle Buddies to make bonus HST units as I made my block. I'm slowly filling a bag with these bonus HSTs, all of which will eventually find their way into one big, scrappy quilt. Now, let's make a 12" Stained Glass Star! A printable version of these instructions is available as a free download in my Payhip pattern shop. Lapis Blue (star) - 5 squares 4 1/2" x 4 1/2"
Turquoise (background) - 4 squares 3 1/2" x 3 1/2"
White (corner stripes) - 4 squares 4 1/2" x 4 1/2"
Coral (corner triangle) - 2 squares 5" x 5"
Aqua (corner triangle)- 2 squares 5" x 5"
*Note* A fat-eighth was not quite enough for the 12 pieces I needed to cut out of the Turquoise for my block. I ended up stitching two scraps together to make a piece large enough for one of the rectangles. 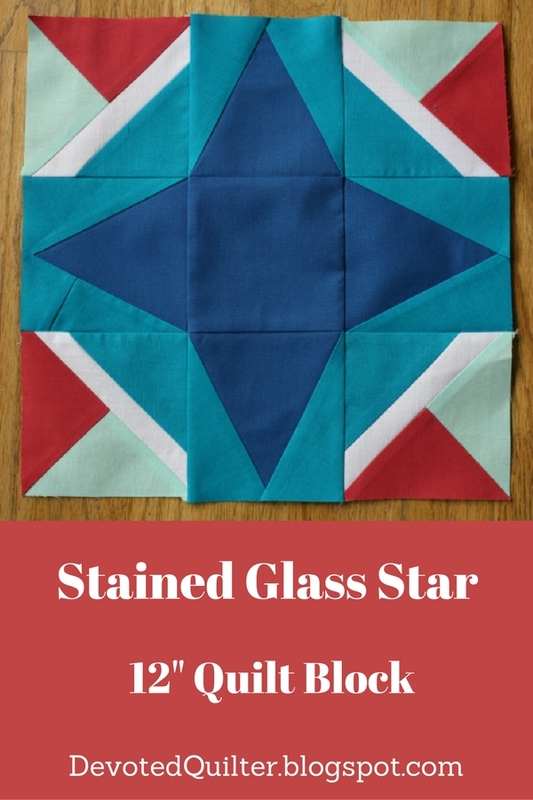 If you're buying fabric to make one Stained Glass Star, you'll need a fat quarter of that fabric and fat eighths for all the others. Draw a diagonal line from corner to corner on each of the Aqua 5" squares. 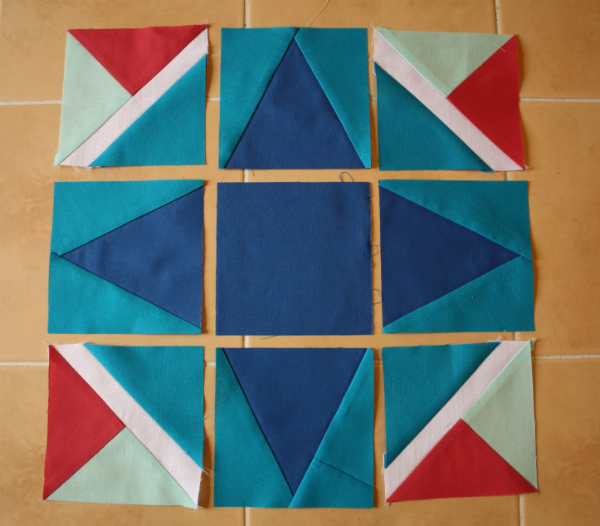 Pair each Aqua square with a Coral 5" square, pinning to keep the squares from shifting. Stitch 1/4" away on each side of the line, then cut apart on the line. Press open and trim each HST unit to 4 1/2". On the wrong side of the HST units, draw a diagonal line that crosses the seam. Pair each HST unit with a White 4 1/2" square, pinning to keep the squares from shifting. Stitch on the line. (Actually, I stitched exactly on the line and my corner units came out a smidge smaller than they should have. You want to stitch almost on the line, so your needle just barely touches the line. This gives you a little extra for folding the corner open.) Cut 1/4" away from the line and press the unit open. My second picture here shows the extra line drawn to make the bonus HST unit. 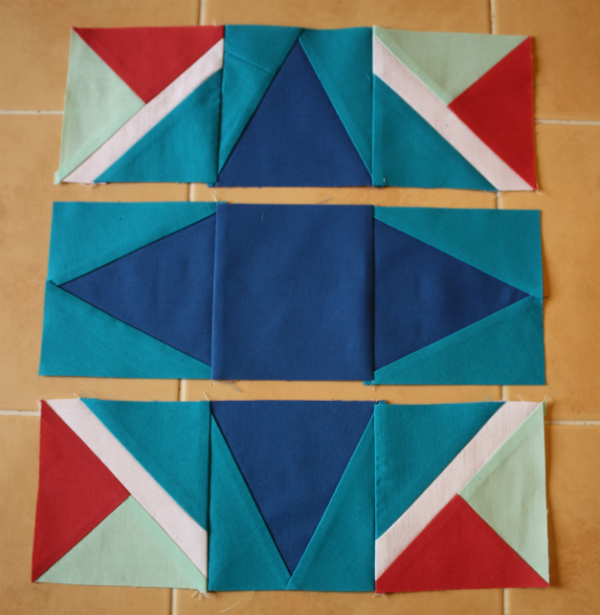 Draw a diagonal line from corner to corner on each of the Turquoise 3 1/2" squares. Position a Turquoise square on the White portion of the corner unit, making sure the line does not touch the corner. Pin in place and stitch to the right of the line so that your needle just touches the line. Cut 1/4" away from the line and press the unit open. Again, the second picture shows the extra line drawn to make the bonus HST unit. 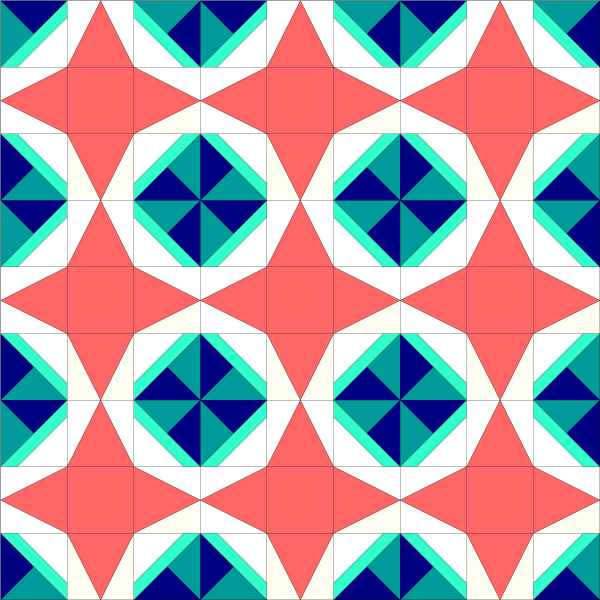 Print out 4 copies of the Paper Piecing Template (available as a free download from my Payhip shop). Before you go any farther, make sure the square measures exactly 4 1/2". If it doesn't, change your printer settings to print at "Actual Size" or "No Scaling". Roughly cut out the template just outside the dotted line. Position one Lapis Blue 4 1/2" square on the back of the template, so that it cover the whole template. Pin in place. Fold the template back on the line separating section A1 from section A2. Trim 1/4" away from the folded paper. Position a Turquoise 5 1/4" x 2 1/2" rectangle along the trimmed edge so that it extends a little above and below the edge. Sew exactly on the line. I chain pieced all 4 of these units. Paper piecing is accurate, but slow, and chain piecing makes it go a little faster! Press open and make sure the Turquoise rectangle completely covers section A2. Fold on the line between A1 and A3, trim and stitch on a second Turquoise rectangle. Press open, then trim around the units on the dotted line. Gently remove the papers. Lay out the corner units, point units and the remaining Lapis Blue 4 1/2" square as shown. Be careful to make sure your corners and your points are all turned the right way! Stitch the units into 3 rows. Voila! Your very own Stained Glass Star! If you make a Stained Glass Star, I'd love to see it! You can leave a comment on this post with a link to a blog post, email me a picture at piecefullydevoted at gmail dot com, or tag me on Instagram (I'm @devotedquilter). Fabri-Quilt is generously donating two 1/2 yard bundles of these beautiful fabrics each day of the hop, one on the blog hop host's blog and the other on the Inspired by Fabric blog. There are a lot of talented quilters in that list, so be sure to check out the blocks they designed! Thanks, again, to Yvonne, Stephanie, Terri Ann and Cheryl for organizing and hosting this hop. Thanks also to Fabri-Quilt for donating the fabrics for the blocks. I can't wait to see the finished quilts! I absolutely love the pinwheels in the corner. Awesome block. Leanne, I knew when I saw the name of your block that I was going to love it. Stained glass is just something that speaks to me, and you really created a beautiful effect with this block. 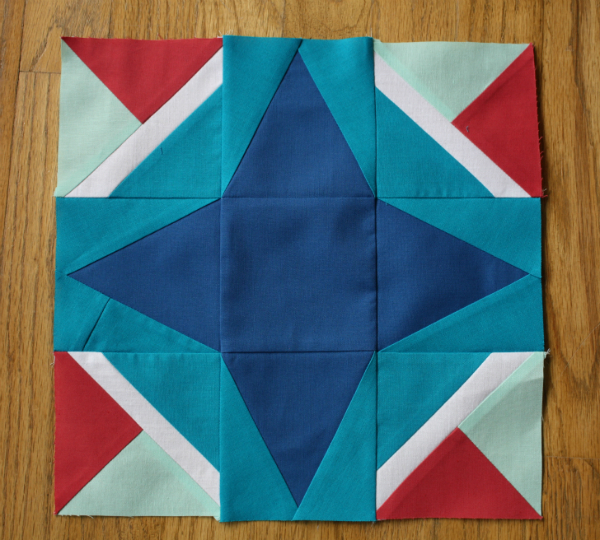 The pinwheels that are formed from the corners as a secondary design when blocks are pieced together are wonderful! Your star block with those great corners is really neat. This is great and love the different color combos. Thanks, Jennifer! I really enjoyed making this one! Very nice block! Great job! Love this block! The corners remind me a little sailboats! So cute! What a pretty block! 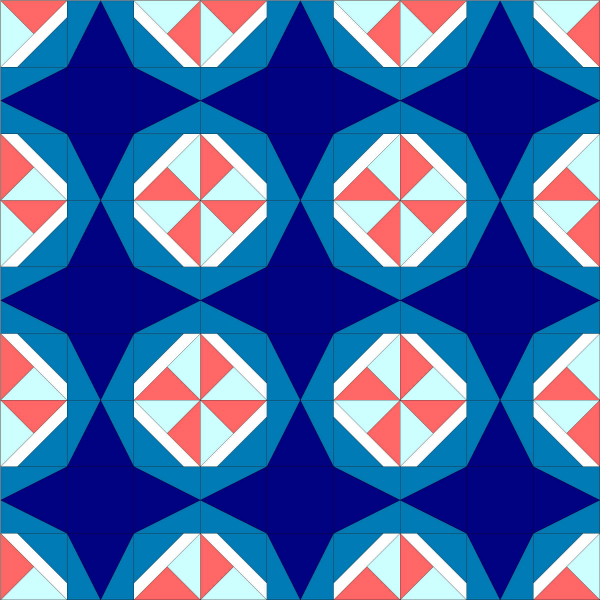 I'm interested in the secondary patterns it would create in a quilt! Nice job! Thanks! I love blocks that create secondary patterns. This block has all the makings of a classic! Awesome job, Leanne. You are so talented! You know what I really like? I like the corner pieces! I mean, the whole block is cool, too but I really am drawn to the corner pieces - they are great. Well done. Really like your block Leanne - love the instant impact it makes in the blog hop colours! This is a great block you designed and the layouts are incredible! Thank you for sharing and your great tutorial. Have a wonderful creative day! What an amazing block. Great job! I love how different this block and the layout looks by just changing the colors. Great job! Woohoo! Congrats, your block is awesome. I love the circular movement created in layout options. oh how pretty!! I'd love to see an entire quilt made from these with some starry borders! Really like the secondary pattern and how you showed the different variations. Good job! Great design Leanne. This will make a very pretty quilt. Thank you for the tutorial. Lovely! 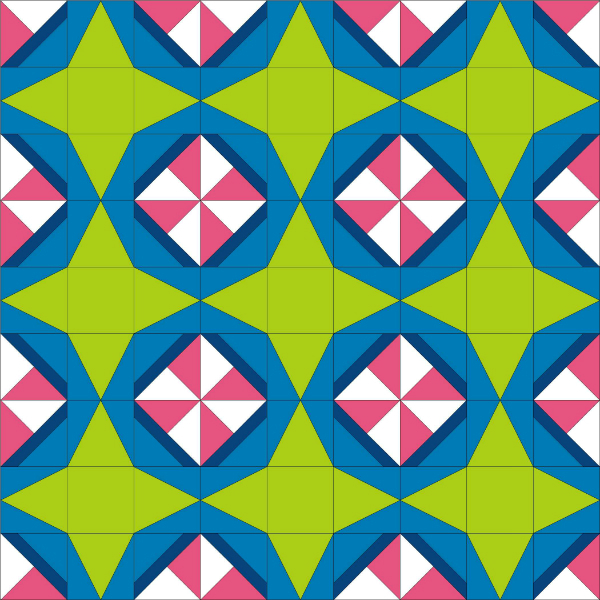 It would be cool to see how a quilt of this block would look with a bold-colored center star and neutral colors. The secondary design would be fun to play with! The pinwheels in the secondary pattern were a fun surprise Leanne! It's a wonderful block - Whoop Whoop for you! This has a great illusion of rounded shapes! I love that part. There's such a difference between the actual block when it stands alone compared to the secondary pattern that forms in group. Neat work! Nice block! I love that you've shown multiple colour variations - it's amazing how colour placement can make such an impact! Tremendous block Leanne. I love the variations according to placement of the block and colors. Also love that it is very 'doable' with your instructions (this from someone who is intimidated by paper piecing.) I like this a lot! I love this block! It makes such an interesting secondary pattern and the the star in the middle has a really nice shape to it.